If you have been involved in a rear-end collision in Tampa Bay, you may have experienced ‘whiplash’. This term is used to describe a wide array of different neck injuries and neck strains, particularly those involving soft tissue damage. A whiplash injury may also be referred to as a myofascial injury, a hyperflexion injury or simply as a hyperextension of the neck. An additional cause of concern is the fact that whiplash symptoms are often confused with the symptoms of other injuries. Shoulder injuries, back injuries and traumatic brain injuries (TBIs) all share some symptoms that are consistent with whiplash. In many cases, these injuries overlap. Whiplash victims often face intense skepticism from insurance companies. Unfortunately, at the current time, there is no medical test available that can definitively prove the existence and extent of a person’s soft tissue damage. This makes these injuries notoriously difficult to diagnose. 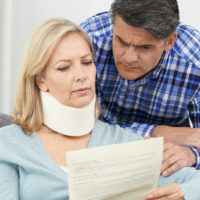 All too often, insurance companies will try to take advantage of the inherent ambiguity involved in whiplash damage claims and will attempt to get out of paying victims full and fair compensation. The good news is that you can fight back. You deserve compensation for every penny of your damages. If you have suffered whiplash, it is imperative that you get yourself to a doctor as quickly as is possible. This is necessary to establish the medical records and documents needed to prove your claim in the eyes of the insurance company. Further, professional legal assistance is a must in these cases. Soft tissue injury victims should always work with an experienced personal injury attorney who can help protect their legal rights and financial interests. Were You Injured in a Tampa Bay Car Accident? The aggressive auto accident claims attorneys at Pawlowski//Mastrilli Law Group can help. For a free, no obligation, review of your case, please do not hesitate to contact our Tampa Bay office today. We take on all personal injury claims on a contingency basis, meaning our firm will not collect our legal fee unless we help you recover financial compensation.